UK and US astronomers have used the Spitzer Space Telescope and the Hubble Space Telescope to detect light coming from the first stars to form in some of the most distant galaxies yet seen. Speaking at the RAS National Astronomy Meeting in Birmingham, Dr. Andrew Bunker (University of Exeter) discussed new evidence that the formation of the first galaxies may have got underway earlier than previously thought. This observational work using infrared images from Spitzer Space Telescope is essential, since theoretical predictions for the history of star formation in the early Universe are highly uncertain. 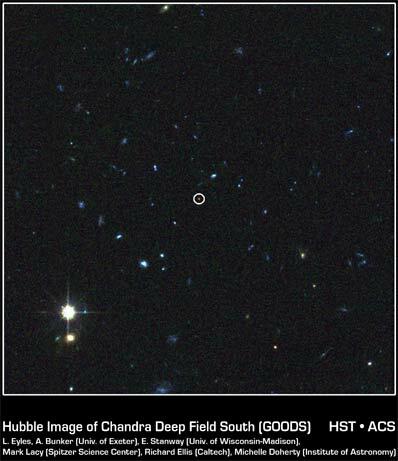 The team, led by Bunker and graduate student Laurence Eyles (University of Exeter), used Hubble Space Telescope data to identify remote galaxies that were suitable for further study. They then analysed archived images taken at infrared wavelengths with NASA's Spitzer Space Telescope. These images, obtained as part of the "Great Observatory Origins Deep Survey" (GOODS) project and the Hubble "Ultra Deep Field" (UDF), covered a part of the southern sky known as the constellation of Fornax (the Oven). "We used the images from the Hubble Ultra Deep Field to identify objects likely to be galaxies 95 per cent of the way across the observable Universe," explained Bunker. "These images are our most sensitive picture of the Universe so far, and they enabled us to discover the faintest objects yet." Intervening gas clouds absorbed the light they emitted at visible wavelengths long before it reached Earth, but their infrared light can still be detected - and it is their infrared "colours" which led the researchers to believe that they lie at such immense distances. Confirmation of their extreme remoteness was provided by the 10-metre Keck telescopes in Hawaii, the largest optical telescopes in the world. "We proved these galaxies are indeed among the most distant known by using the Keck telescopes to take a spectrum," said Dr. Elizabeth Stanway (University of Wisconsin- Madison). The next step was to learn more about the stars within these most distant galaxies by studying new infrared images of this region of space taken by Spitzer. "The Hubble images tell us about the new-born stars, but the new infrared images taken with the Spitzer Space Telescope give us extra information about the light that comes from older stars within these distant galaxies," said Laurence Eyles, who studied the Spitzer images of these objects as part of his research for a doctorate at Exeter. "This is very important, because it tells us that some of these galaxies are already 300 million years old when the Universe is very young." "It could be that these were some of the first galaxies to be born," said Michelle Doherty (Institute of Astronomy, Cambridge). Using the Spitzer images, the team was able to weigh the stars in these galaxies by studying the starlight. "It seems that in a couple of cases these early galaxies are nearly as massive as galaxies we see around us today, which is a bit surprising when the theory is that galaxies start small and grow by colliding and merging with other galaxies," said Dr. Mark Lacy (Spitzer Science Center). "The real puzzle is that these galaxies seem to be already quite old when the Universe was only about 5 per cent of its current age," commented Professor Richard Ellis of Caltech. "This means star formation must have started very early in the history of the Universe - earlier than previously believed." The light from these first stars to ignite could have ended the Dark Ages of the Universe when the galaxies first "turned on". It is also likely to have caused the gas between the galaxies to be blasted by starlight - the "reionisation" which has been detected in the cosmic microwave background by the WMAP satellite. The results from WMAP and the Hubble Ultra Deep Field complement the new work done by Bunker's team with the Spitzer data. Taken together, they suggest that the Dark Ages ended sometime between 200 and 500 million years after the Big Bang, when the first stars were born.